First of all, the commissioner comes from New York, which is also where Donald Trump is from, and the commissioner’s father was a Republican who served in both chambers of Congress. Somehow, this makes Roger Goodell a mysterious figure to Trump; more importantly, the president more than doubles the NFL’s 2017 ratings decline, while also providing a dipshit reasoning for that decline. ...and so on. (ESPN, you’ll recall, actually gained a few viewers.) There were nearly 500 scripted series aired on U.S. TV in 2017, more than double the number that aired in 2009. Netflix, Amazon Prime, and Hulu are driving this massive increase in available programming, and nearly every broadcast network is taking it on the chin as a result. Overall, broadcast networks lost 16% of their viewers in 2017; cable networks lost 11%. And that’s using Nielsen’s “C3" ratings formula, which counts DVR viewings. The NFL only lost 9%. 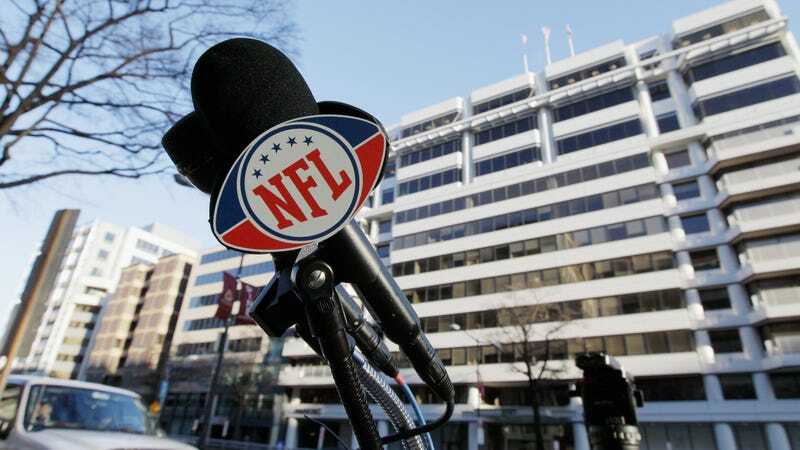 The NFL’s ratings have fallen substantially less than TV as a whole. Indeed, Sunday Night Football remained the highest-rated show for the seventh straight season. Ten years ago, it didn’t even crack the top 10. Monday Night Football’s viewership fell, but only by 3%. Are NFL ratings down? Yes, but only if you don’t compensate for the overall decline in TV viewers due to streaming services, et cetera. If you do compensate for the overall decline in TV viewers, NFL ratings are up. If you believe, as Donald Trump has stated to be a fact on no fewer than ten occasions, that the NFL’s viewership is affected by the “flag controversy,” then there is only one logical conclusion at which you can arrive: that American TV viewers watched more of the NFL because of player protests. The NFL’s share of a rapidly-shrinking TV audience grew in 2016, and it grew by an even larger amount in 2017. As a percentage of people who are watching television, the NFL is commanding its biggest audience in the history of the league. The NFL lost 9% of its viewers. NFL ratings are not “down.” And they certainly aren’t down 20%, no matter how you measure it.